Harry Bates and John McCarthy have claimed their second round win of the 2018 CAMS Australian Rally Championship, keeping their title hopes alive. The BOTT Adelaide Hills Rally proved a happy hunting ground yet again for Subaru do Motorsport’s Molly Taylor as she claimed second outright in South Australia for the third year in a row, while Zayne Admiraal and Matthew Heywood were the surprise packet of the round, the local South Australian team snagging third outright. Bates took out heat one in style but didn’t have it all his own way on day two, facing a super tight battle with Evans. Evans claimed the honours in heat two, winning the heat by 18.6 seconds, but Bates had enough points to win the round along with the bonus point for stage wins, the Yaris AP4 setting the fastest time on 11 of 17 special stages. There was nothing between Bates and Evans as heat two went on, just 0.6 of a second between the two rivals on SS14 and SS15 with a win-a-piece and amazingly, the pair tied in a dead heat on the 14.38-kilometre SS13. Bates was pleased with the round win but equally satisfied with claiming the bonus point for stage wins. “You always want to come away with not just taking a win but also being the fastest person on the weekend as well. For us that was as much the goal as the result,” Bates said. Taylor said the pace was definitely stepping up as the 2018 Championship approaches its finale. “The pace was really hot this weekend and we had a couple of moments ourselves and a couple of errors on my part and we were just all pushing really hard,” said Taylor. Zayne Admiraal finished on the podium in his Subaru WRX. Admiraal was thrilled with his first ARC podium finish. “It’s crazy, I didn’t expect that, the field in front of us was incredible as well,” he said. 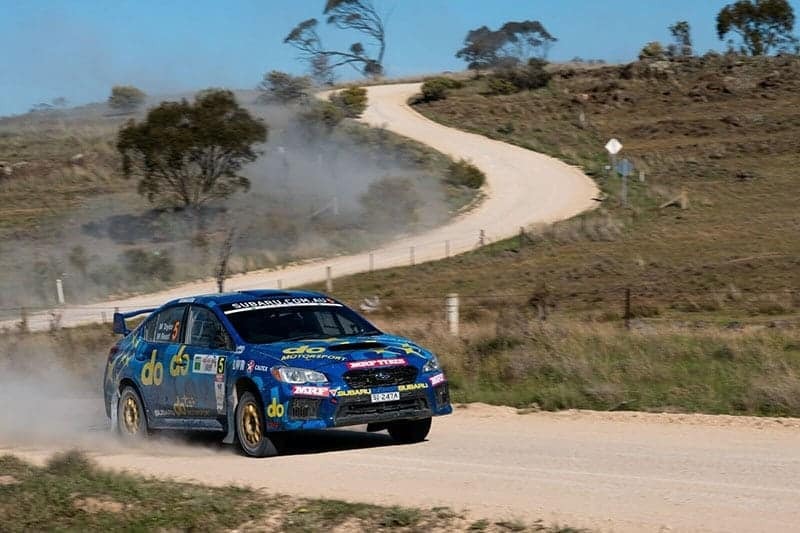 The roads to the north-west of Adelaide proved troublesome for a number of competitors – Brumby Bar and Grill’s Chris Higgs had a right front ball joint failure on the third stage of the day which caused a small car fire. Thankfully, they were able to extinguish it quickly and rejoined the afternoon stages. Neal Bates Motorsport’s Lewis Bates and Dale Moscatt were looking at a top five finish until they were forced to park the Toyota Corolla S2000 due to an engine drama while Championship contender Steve Glenney’s event came to an abrupt end on SS14, the Tasmanian rolling the Contel Communications Subaru Impreza WRX STi. Evans’ rollercoaster weekend ended on a sour note, with the Skoda Fabia R5 pilot facing a Stewards hearing on Sunday evening post the event for failing to follow emergency proceedures. Evans and Searcy were excluded from heat one and were penalised a further 20 Championship points. Evans and Searcy intend to appeal. 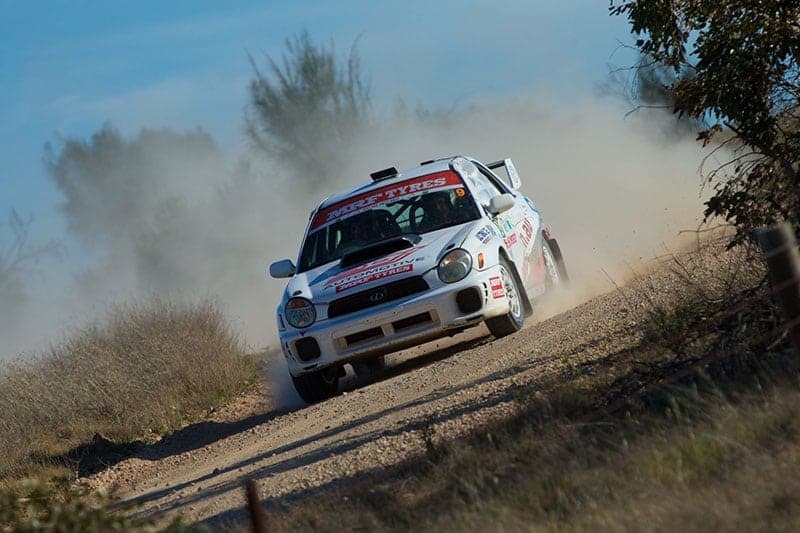 In the MRF Tyres South Australian Rally Championship, Admiraal and Heywood took the honours, with Peter Schey and Kate Catford claiming second along with the 2018 title. Jamie Pohlner and Ken Moore finished third. The ARC now heads to Coffs Harbour for the sixth and final round at Kennards Hire Rally Australia where Australia’s best rally teams will do battle alongside the World Rally Championship crews in what will be a mouth-watering finish to the 2018 Championship.